If you saw this headline, you might have skipped past the story: “Mueller teams up with New York attorney general in Manafort probe.” That doesn’t sound like a particularly significant development in the Russia/Trump probe. But that one needs to be paired with this article from NBC News, which points out that presidents can only issue pardons in federal cases. The reason that is important is because Mueller seems to be approaching this case like he would a mob investigation—by threatening prosecution of underlings in order to pressure them into cooperating. In the midst of that, Trump could be sending signals that he will hand out pardons to those who refuse to cooperate. Having NY Attorney General Schneiderman waiting in the wings with state indictments would put the brakes on all that. Trump can pardon anybody facing charges from Mueller, but not from Schneiderman. It is probably significant that Mueller is letting this fact be known to Trump’s inner circle. Trump’s biggest source of leverage over Mueller just disappeared. That point about Mueller letting this fact be known is an important one to keep in mind. 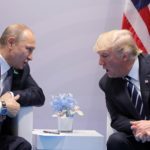 One of the reasons that we haven’t been witnessing daily bombshells about the Trump/Russia connection is that Mueller seems to be keeping a lid on leaks. And yet this one got out there.